I made these but didn’t have any unsweetened applesauce,so I used the regular cinnamon flavored that I had on hand.My intention was to reduce the sugar but I mistakenly left it out !! Surprisingly they aren’t bad at all . 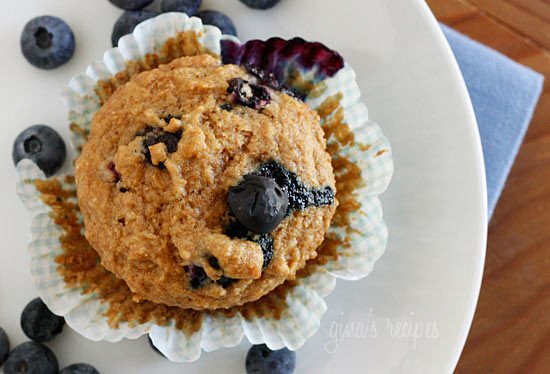 They are great for breakfast , and the blueberry’s sweetness really shines though. I did add a bit of milk to loosen the batter up as it seemed dry . Do you refrigerate these after or can they be left on the counter in a container? Thanks! Quick. Easy. Delicious. My 3 and 6 year olds say they are the best blueberry muffins ever. Hey Gina – any chance you know what the new freestyle points would be for this recipe? I’m calculating closer to 3, but want to be sure. Thanks! Yes, the Smart points are updated to the new Freestyle so that would be 5. Can frozen blueberries be used, or will it be too runny? Thses just came out of the oven and look delicious. I used regular white sugar and added about 1/2 cup milk because the batter was a thick, crumbly dough. Recipe filled 12 cup muffin tin generously so I have beautiful lofty muffins. Waiting for them to cool. I make these regularly. They are really good. If you don’t have vanilla then pure lemon extract is an excellent substitute. I made these a few days ago. They turned out nicely. 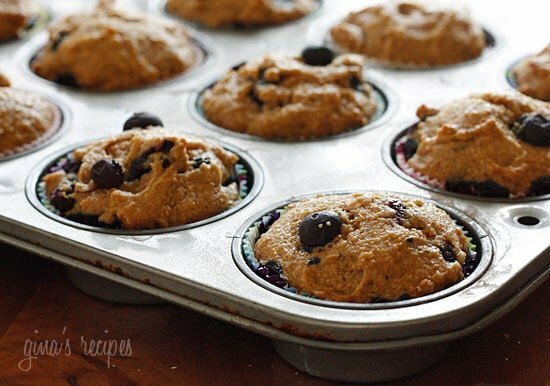 I used frozen blueberries as I have over 20 gallons to use in my freezer 🙂 I baked them using silicone muffin pans. Thanks Gina. Can I substitute the pastery flour with gluten free flour? I haven’t tried it but it should work. Love this muffin recipe, I think by BF loves them even more! He has been having some digestive issues lately but these don’t bother him and he’s asked me to make more about 5 times in 3 months! He has lost a lot of weight so it’s wonderful nutrition for him! I was thinking of trying to make an apple cinnamon version, has anyone tried that??? Made these this morning – delicious! I had regular whole wheat flour… they turned out great. Another winner, Gina!! 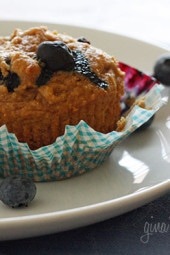 Delicious muffin and super easy recipe. The only thing is I calculated the Smart Points for Weight Watchers and it’s actually 6 sp not 5 unfortunately. However desoitw this error I’m very grateful you provide all the nutritional info and most always the WW points. Really nice touch. Thank you! Can you use coconut flour?? Could I substitute flax meal for the flour either completely or partially to make this low carb? Can these be skinnified further? Egg substitute, leaving out the butter, etc.? 5 SP is usually more than I want to spend. I've made both these and the Insanely Good Blueberry Oatmeal Muffins and I have to say I actually prefer these. They're not super sweet, which I really like, and have a texture similar to bran muffins. What's best is they reheat very well in the microwave, not gummy at all! I just made these… they were great. I used organic whole spelt flour instead of the pastry flour it calls for. Added a good splash of milk and mixed it in well. 25 minutes on my oven…. made 14 good sized muffins. My 4 year old loved them and so did hubby… def a keeper! What would be the nutrition info for muffins that fit in the 6-tin pan? OMG… I just made these and couldn't believe something so good could be low fat!! I did the same as the person above.. I used half wholewheat and half white flour, added a little bit of milk because it was a little dry and I used mashed bananas instead of applesauce thanks for letting us know a good substitute! I LOVE all your recipes… you have definitely been one of my motivation factors for eating healthy! Thank you!!! I just made these, though I had to use half whole wheat/half white as we don't have pastry flour here. They taste really good but the batter was way too thick and I had to add some milk! I have always shied away from recipes that call for whole wheat flour (perhaps due to dense pastry nightmares from my youth), but I decided to go for it for this one. Got the Bob's Pastry flour (my first ever whole wheat flour purchase) and this recipe is amazing! These turned out beautifully! I doubled the recipe, and substituted Splenda for sugar (husband is diabetic). They stick to the papers, but you will find a way to get it off because they are so delicious! I will keep 60 pounds off! Thank you for helping!!! My 10 yr old daughter and I made these today. We used half white have wheat sifted flour and kept all other ingredients. The mixture was dry so we added about 2T water. They turned out so good! We will all be enjoying them for breakfast this week. So i know this is a rather old post but I just discovered this site! 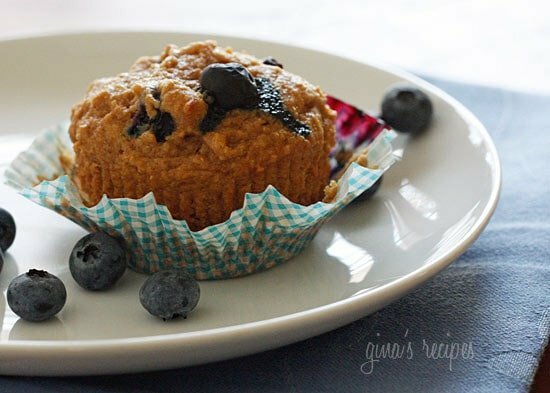 I am so excited to make these muffins as I am always looking for low calorie options for delicious treats. One quick question, this calls for baking soda, do we need any kind of neutralizing acid agent such as milk so the muffins don't come out bitter or does the apple sauce already take care of that? Ohhh can I use smashed bananas as an alternative to applesauce? I can't use applesauce so was looking for an alternative! Please let me know! Use your blog for everything! Nice to not feel deprived! Thank you!!!! I made these this morning used egg beaters and splenda and they still came out fantastic! These are AMAZING!! I don't feel guilty eating them either because they are so much more healthy then regular muffins!! Dear Gina, I have a question – I don't seem to have enough muffin batter to make 12 complete muffins; am I doing something wrong? And the batter seems to be really thick; I'm using whole wheat pastry flour and 1 egg as in the recipe. Please advise, otherwise they are terrific! Could I add rolled oats to this? And if so, would it be better to throw the oats in blender or leave them as is? Thanks so much. I made these with gluten free flour excepting it to turn out like crap. Its difficult baking with gluten free flour blends. To my surprise they turned out fabulous. I mean FABULOUS!!!!!!!!! Best gluten free muffins I've ever made. Hmmm, I tried these and I followed recipe exactly as is. They looked amazing, smelled great but they didn't have much taste. They almost remind me of a bran muffin. I think I will try it next time with a few modifications (like sprinkling some raw sugar on the top so that it will crust). Maybe that will help with the flavour. I think my favourite muffin recipe that you have posted is the pumpkin spice muffins….they were perfect consistency and sooooo tasty! Hi Allison, if you search this page for "apples" a few people have tried it and posted how the muffins turned out. These are yummy. I also alter these to lower the calories and they are still yummy….here is the alteration:used sweet-n-low brown sugar, splenda sugar, and no fruit….still tastes awesome…I am currently trying it with almond extract to see what I get…..used splenda, no fruit, & smart squeeze butter…still yummy to my family…. This recipe can't be right, the batter is like cookie dough…I even added a half a cup of milk. Is something off? ive tried the recipe as is… amazing. And today i sub'd raspberries and added some dark choc chips. had to add some almond milk to thin the dough a bit, they are soooo good!!! I don't want to use the white sugar, what should I use to substitute? I am trying to have a clean recipe. What can I substitute for the applesauce? My family is allergic. I just made these for breakfast and to bring to a "lunch". They are out of this world! The batter was thicker than I expected, but I ignored that issue. I used splenda because my lunch guest is type 2 diabetic, and when I make things with a sugar substitute they are happier I have not used regular sugar. I did want to add a comment on the egg beaters. I only use fresh eggs. I have recently read an article about new research on egg nutrition in the April 2012 issue of Runners World Magazine titled "Sunny side up". They detail new information about egg nutrition and how eggs, and even their yolks help create a healthy heart. "Numerous studies have debunked the link between eggs and heart disease. In fact, research shows that eating several eggs a week results in cholesterol particles that are less likely to spell cardiac trouble. What's more, a unique protein found in egg yolks blocks platelets (the cells responsible for blood clots) from clumping together inside blood vessels, thereby minimizing heart-attack risk." I am not a runner, but my daughter is, so that is where I read this article. I am a weight watcher's member, and I did notice that by using the splenda, the points were lowered to 3. Thank you for a wonderful recipe and a wonderful site. I just crossed the 80 pound weight loss marker last week! one additional note, is to always consult your physician before you make any nutritional changes, especially if you have any form of heart disease! The first batch I made were a little on the thick side which made for a denser muffin. Tonight i am gonna try adding some yogurt and some extra fruit compote. Can I use whole wheat flour (not pastry flour)? Your questions have been answered about a million times in earlier comments. In a medium bowl, mix eggs, melted butter, vanilla and applesauce. Add to the flour mixture and stir until just blended. Gently fold in blueberries. Pour batter into 12 lined muffin tins and bake at 325° for 25 minutes, or until a toothpick inserted in the center comes out clean. Cool for about 10 minutes. All I can say is WOW, thanks you so much for this fantastic recipe. I made some substitution but it turned out fantastic and my husband loved them…thanks again. Just came across your site so I haven't tried these yet. But I was looking for a low fat muffin receipe that wasn't complicated (I'm not a baker). This receipe seems to be what I'm looking for so Thanks! Also loved that you gave the nutritional info. I make these all the time, they are fantastic. I've also made them using cranberries and orange zest with a small amount of pecans. Every bit as good. LOVE THEM!!!!!!!!! These were delicious! I substituted 1/4 cup of the w.w. pastry flour with coconut flour (and added the addition 1/4 cup water). Yum! Might even try to sub. a little bit more next time. Also used 1 tbsp greek yogurt/1 tbsp butter. I split the batter up and also tried a triple berry frozen blend and just plain with chocolate chips. All were great! i noticed teh batter is really thick, is it suppose to be? or do i need to add another ingredient?? Ok..just made some with Strawberry yogurt in place of the apple sauce (Didnt have any) and a touch of almond milk..They look awesome and moist with the wholemeal flour as well..Will add another comment after tomorrow, when I eat one, as I have had almost my total amount of carbs for today. My daughter shared your website and I am loving it!! I made these muffins last night and they are wonderful! Best thing is-I don't have to feel guilty about eating them! Thank you for taking the time to slim down some awesome recipes! I can't wait to try more! I just made these for breakfast and my three hungry kids devoured them! I substituted chopped apples for the blueberries and added a touch of cinnamon to them before folding into the batter. I used 1/2 whole wheat flour and 1/2 unbleached all-purpose flour and the consistency was fine and the muffins were moist. I also baked them in a "muffin top" pan instead of a traditional muffin pan. 18 minutes at 325 degrees and they were done. Thanks for another great recipe! I just made these today for Easter brunch and boy were they tasty! My 3 year old son devoured his and immediately asked for more! I can't believe how healthy, yummy and easy they were to make. Definitely going to make these regularly. I have been making these once a week for a couple of months now.I use ww flour,I add 1/4 cup nutracleanse and I have used a variety of different fruit.Froze,Fresh and Canned.When the batter seems thick I just add more applesauce or some low fat milk.And I always use just egg whites.They are always delish!! I made these today and the batter was very thick. Is it suppose to be like that? Delicious! I used 1/4 cup egg beater, half white & half WW pastry flour and ICBINB. Very yummy! I hope they sell well at the bake sale! Where can I get the whole wheat pastry flour???? I make a very similar version of these muffins (using the half all-purpose flour & half whole wheat flour) but I'm going to try with the Whole Wheat Pastry flour next time…hope that gives them a softer texture. I'd highly recommend adding about a tsp of lemon or orange zest (or half of each, as I do when I have both in the fridge!) and a dash of cinnamon to the mix….the zest and the cinnamon give the flavor an amazing boost!! Yum!! I made these this morning and they turned out so good! I used 1/2 light whole wheat flour and 1/2 regular flour. I added milk because the batter was thick. I love the idea of using applesauce to replace the fat. I plan to use it to adapt some of my recipes to make them healthier. This recipe is definitely a keeper! These were awesome! My kids even ate them! I love these! Make them all the time!! Thanks! These are great, nice and moist! I even substituted Chocolate Chips for the blueberries and they were amazing. Gina, thank you again for another delicious AND healthy recipe. 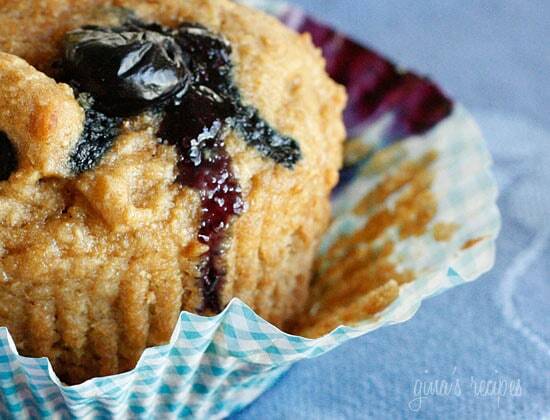 I made a half recipe of these this afternoon, subbed in Trader Joe's whole wheat white all purpose flour (1 cup less 2 tbsp) and used a full cup of fresh blueberries. I also added lemon zest to the batter and a sprinkle of white sugar and more zest on top. The taste of my Mum's muffins without all the guilt. Yum. Yum! Obviously the texture and size aren't going to be the same as the calorie- and fat-challenged Dunkin' Donuts classic I'm weaning out of my diet, but the blueberries are big, juicy and wonderful on every bite and I quickly got used to the WW pastry flour mixture. Because the crunchy sugar top is what I really crave on the DD version, I added 1 tsp of Sugar In The Raw to the top of each muffin, which only added 15 calories…it was actually too much sugar and I'm going to cut that back to a half teaspoon next time. Froze the batch and took to work with a bag of hard-boiled eggs…one egg and one muffin made a filling breakfast–pleased to report I made zero trps to DD in the food court this week. My kids loved them too, and were very sad I took them to work. I’m like you, I used to get a DD Blueberry Muffin all the time but the points on Weight Watchers were sky high. You’re right about the sugar on top. When you added the sugar did you put it on before baking? Do you put the raw sugar on before baking? Wow! When I put these in the oven I didn't expect much (the batter was an odd consistency) but they came out amazing! I only made a half batch and substituted a very ripe banana for applesauce (it was what I made on hand). Turned out amazing. The batter was very sticky like cookie dough which is what made me worry initially. Very glad to find a healthy recipe that is easily halved to make just 6 muffins. This is my first time to your site but I will definitely be back! Thank you! I made these last night using half whole wheat and half all purpose flour and they were delicious! Every single thing I've made from this site is amazing, Gina – thank you!! I made these this morning and they are delicious! Thank you! I made thse with half ww flour and half ap. Added some chopped walnuts and only had light margarine. But I thought they were still tasty! Just found your website, and it looks wonderful!! I can't wait to try the blueberry muffins. Now to take the time and go through the rest of the recipes. I have just gone back to Weight Watcher so thank you so much for putting the point values on. Hello! I just took these out of the oven and they are SO good! I used 1+1/2 cups whole white wheat flour and 1/2 cup of unbleached white flour….I only had chunky sweetened applesauce,so I just added two tablespoons of brown sugar. I put a ripe banana in it because it was a little gummy. Topped it off with a sprinkle of splenda on top and they turned out delish! Thanks so much!!! It will still work but not sure if they will taste as good, texturewize.